I finished up the loopy L fill around my diamond sashing from my previous post and shot a video while I did it. It turned out nicely I think. Made the diamonds pop without being horribly dense or time consuming. You can still see some of the markings above. The lines help keep things straight and keep me from forgetting to change the design when I get to the small squares. 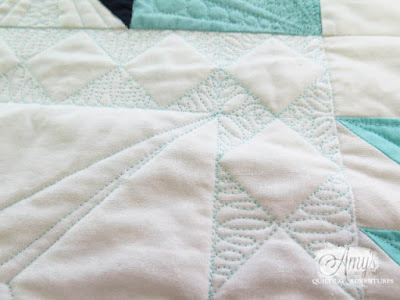 Have you been like me and gotten so 'in the flow' that you quilt something you shouldn't? Happens to me more often than I like so I use my handy purple pen. Now I'm working on the interior of the block around the 4 pointed twisted star. Pebbles, paisleys, and rulered lines are involved. Craftsy is doing a flash sale this weekend! Use my discount link to get up to 50% off on all classes! My class, Quilting with Rulers on a Home Machine is reduced to $24.99 with the general sale, but use this link: My Class at 50% off! and it will give it to you at 50%. Craftsy sales usually have a theme, and this one does too. They're talking about the fun of using crafts and creativity together as we gather during this time leading up to the holidays. 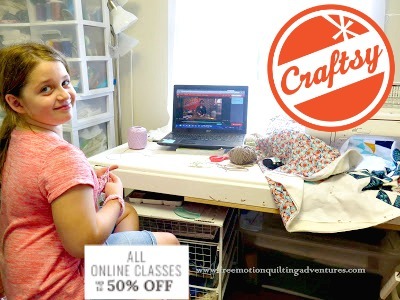 I couldn't bring myself to use their beautifully done pictures of strangers (to me) when I had this sweet girl's pic available from when we were actually using a Craftsy class together. There are some really great free motion quilting classes on Craftsy right now. Besides my class, there's a class from Lori Kennedy of the Inbox Jaunt. 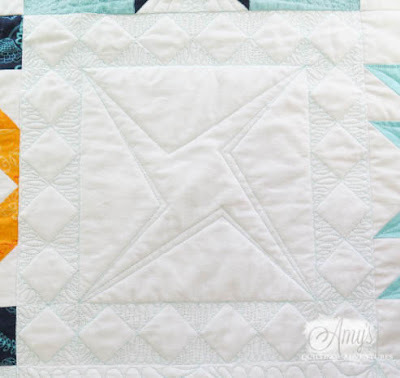 I haven't taken Divide and Conquer: Creative Quilting for Any Space yet, but I keep up with her blog and she's so stinkin' talented and creative with her designs. There are several more from Leah Day, Patsy Thompson, Angela Walters, and more. Patsy's talked about my work with rulers being an inspiration to her, so let me point out that she's got a new class on feathers with Craftsy. 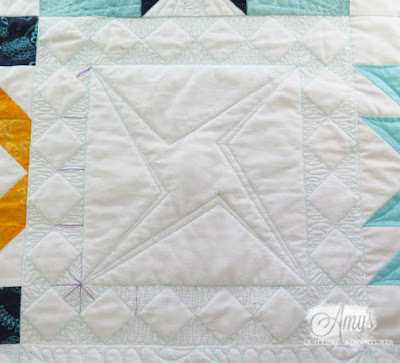 There are two great classes to take that could be utilized with ruler work: Angela Walters' Dot to Dot Quilting and Kim Brunner's Machine Quilting with Templates. I'm using a polyester thread called Glide. I love it. My stitches are fairly uniform, but they do vary!